In the spring, trees and grasses start to bud and flowers begin to emerge. And millions of people start to sneeze. 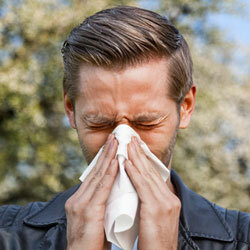 Spring is the worst season for seasonal allergies. But WebMD has some suggestions for easing your suffering. Stay inside when the pollen count is very high. You can find information on pollen levels online, on TV and in the newspaper. Pollen counts are usually worst in the morning. Keep doors and windows closed when pollen counts are high. An air purifier might help provide further relief. Clean or change your furnace and air conditioning air filters often. Also, clean air vents and flat surfaces, where pollen can land. Take a shower and wash your hair after you go outdoors. Pollen can collect on your hair and skin. Wash your clothes after coming inside. Pollen also can collect on your clothes. It is best to remove your clothes and shoes as soon as possible, and put the clothes in the washer. You don’t want to drag pollen all through your house. Vacuum often and thoroughly, and wear a mask when you vacuum. Vacuuming can kick up pollen and other allergens such as dust and mold, which can make your allergies worse. Over-the-counter treatments for allergies include antihistamines, which combat histamines the body releases to fight the allergies; decongestants, which relieve congestion and swelling; combination antihistamine and decongestant drugs; nasal spray decongestants; steriod nasal sprays, which reduce inflammation; and eye drops for itchy, watery eyes. There also are prescription medications that can provide relief. Work with your doctor to find a treatment or combination of treatments that will help you feel better until allergy season is over.